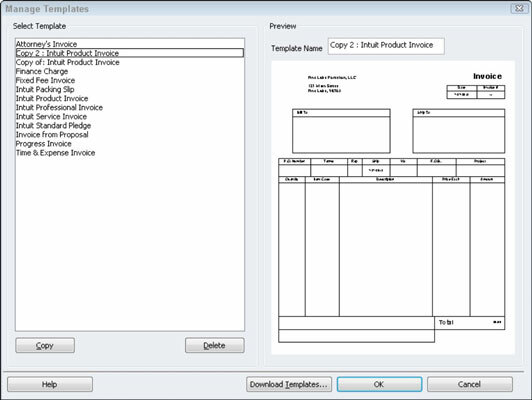 To choose an invoice template to customize, display the Create Invoices window in QuickBooks 2012. You can do this by choosing the Customers→Create Invoices command. Next, click the Customize button. QuickBooks displays the Customize Your QuickBooks Forms window, which provides you with two choices: First, you can click the Create New Design button to go to a website that steps you through a full-fledged graphic design session for the invoice form. Alternatively, you can click the Customize Data Layout button to access dialog boxes that let you make more minor (yet still substantial) changes to the invoice form. If you click the Create New Design button, simply follow the website’s instructions, which appear on the web pages. If you click the Customize Data Layout button, QuickBooks first asks whether it can make a copy of the already displayed invoice in the Create Invoices window template (you need to agree to this). If you click OK, QuickBooks displays the Additional Customization dialog box. But you don’t want to start with the Additional Customization dialog box. No way. You actually want to use the Basic Customization dialog box, so click the Basic Customization button. 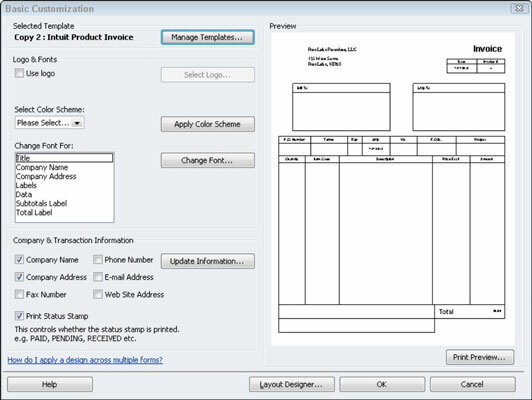 You may need to maximize the Create Invoices window in order to see the Customize button. To identify which invoice form template you want to customize, click the Manage Templates button and then, when QuickBooks displays the Manage Templates dialog box, choose the invoice template you want to customize. QuickBooks initially supplies a custom invoice template and a finance charge template you can customize. Alternatively, you can click one of these existing templates and then click Copy to create and then customize one of these templates. When you click OK, QuickBooks closes the Manage Templates dialog box and returns you to the Basic Customization dialog box.